Facebook is adding video to Instagram, its popular square-shaped photo sharing service, allowing for 15 seconds of clip-by-clip video on iOS and Android devices starting today. With the swipe of a finger, the Instagram app transitions to Vine-like video capturing software, which is launching with 13 new custom filters designed for its 3-second-minimum clips. "What we did to photos, we just did to video," announced Instagram Co-founder and CEO Kevin Systrom at Facebook headquarters today. Not exactly distancing his company from its hipster image, Systrom showed how video for Instagram works by splicing together a 15-second movie of a barista making a latte. To that point, Instagram's goal is for users to upload real-world moments using its app. Systrom said the company will consider allowing video from outside sources in the future, but only if it makes sense and is a simple experience. Video for Instagram differentiates itself from clip-by-clip movies made by Vine in a few ways. First, it has a handy delete feature in which users can trash the last segment of their video if they make a mistake. This may be enough for perfectionist Vine users to switch over to Instagram right away. There is also a custom cover frame that just makes sense. Now users can select a preview image that others see before watching the video, choosing a specific frame through a flip-book tip story board stream located along the bottom of the screen. Videos don't loop in Instagram's service like Vine, though both save save images to the camera roll. 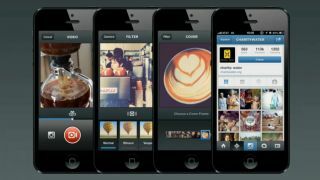 Finally, Instagram apes its social camera competitors by allowing users to post to Facebook natively. Now your friends won't have to exit their precious newsfeed to watch your spliced-together video. In addition to adding filters and debuting new video tweaking features, Instagram is out to fix everyone's shaky iPhone camera issues with video stabilization built into the iOS app. "We teamed up with a handful of the world's leading video scientists and created something really awesome," said Systrom. Showing a series of videos with and without Cinema, the company's co-founder demonstrated how the app mimics the image stabilization capabilities of higher-end computer software. "When you're running, chasing your kid, trying to get a video, now you have the power of Cinema in your pocket," said Systrom. "This changes everything." Eventually, this anti-shaky camera feature will work its way to Android devices, the Instagram team told us. The feature is automatically enabled, but users can shut it off if they choose. Video for Instagram is clearly a direct competitor to Twitter's Vine, the 6-second video sharing competitor by the 140-character social media network. Since its January launch, Vine has captured video for more than 13 million users and expanded its circle of bite-sized directors by releasing an app for Android earlier this month. Facebook has previously tried to clone a competitor's success by releasing Poke, an app that is nearly identical to Snapchat and its self-destructing video. While Snapchat remains in the top 10 apps on the App Store along with Vine and Instagram, Poke has been slow to capture the same attention and has fallen out of the top 300. The difference this time around is that video for Instagram is built right into the existing app, which already has a thriving community and young demographic. Instagram's video addition is the biggest new feature for the photo-sharing service since Facebook acquired the company and its 12 employees for $1 billion (about UK£648 million, AU$1.82 billion) in April 2012. In the past 14 months, the filter-focused app has helped more than 130 million monthly users stylize and upload their photos, and now it aims to do the same for video. "It's everything we know and love about Instagram, but it moves," said Systrom of his company's entry into the world of bite-sized video. Importantly, video can only be captured with Android 4.1 and up, and the function is not yet viewable on Android devices, though it should be later today. All versions of Android can view video however, as well as desktop users. Want to know how to take pro Instagram photos? Check out our guide.